PART 1: Download and print the Score Sheet to help you keep track of your scores. If your student did not master the first placement assessment you administered, give the next lower numbered assessment. Move backward one assessment at a time until your child achieves a mastery score, or until your child has taken the lowest available assessment. Mary took Reading Assessment 6 and scored a 12 (not mastered). Mary took Reading Assessment 5 Part A and scored a 16 (not mastered). No need to take Reading Assessment 5 Part B because both must be mastered. Mary took Reading Assessment 4 Part A and scored a 21 Mary took the Reading Assessment 4 Part B and scored a 17 (BOTH mastered). According to the Reading Placement Table below, Mary achieved mastery on the Reading Assessments 4 Part A and B and would be placed in fifth grade. If your child mastered the first placement assessment you administered, give the next higher numbered assessment. Move forward one test at a time until your child does not achieve a mastery score, or until your child has taken the highest available test. Mike took the Reading Assessment 4 Part A and scored a 22 Mike took the Reading Assessment 4 Part B and scored a 24 (BOTH mastered). Mike took Reading Assessment 5 Part A and scored a 13 (not mastered). No need to take Reading Assessment 5 Part B because both must be mastered. 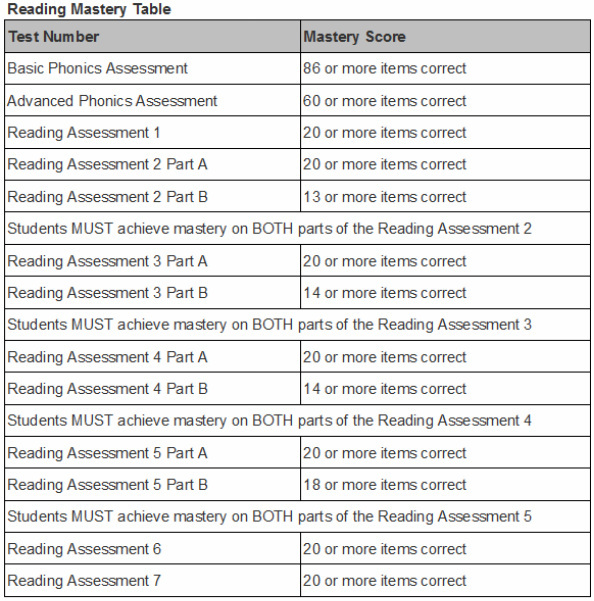 According to the Reading Placement Table below, Mike achieved mastery on the Reading Assessments 4 Parts A and B and would be placed in fifth grade. Score the assessment using the answer key that accompanies it. Use the Mastery Table to determine whether your student mastered the first assessment taken. If the Language Skills test result is the SAME AS OR HIGHER than the Reading test result, select the grade indicated by the Reading test. If the Reading test result is ONE GRADE HIGHER than the Language Skills test result, select the grade indicated by the Reading test. If the Reading test result is TWO GRADES HIGHER than the Language Skills test results, select the average grade between the two. Example: If Mary's Language Skills Placement test resulted in a recommendation of grade 2 and Mary's Reading Placement test resulted in a recommendation of grade 4, we recommend grade 3. If the Writing test result is the SAME AS OR HIGHER than the Reading test and Language Skills test results, select the grade indicated by the Reading and Language Skills tests. If the Reading and Language Skills test results are LOWER than the Writing test results, select the grade indicated by the Reading and Language Skills tests. If the Language Skills test results and the Writing test results are LOWER than the Reading test results, select the grade indicated by the Writing and Language Skills tests.